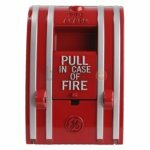 A fire alarm pull station is an active fire protection device, usually wall-mounted, that, when activated, initiates an alarm on the system. Pull stations must be restored to the ready position using a special tool or key in order to deactivate the alarm sequence and return the system to normal. Primitive manual stations requiring only a single action or hand motion to activate, can be subject to unwanted activation by jarring or accidental contact. Early strategies to cope with this problem included requiring the operator to break a glass pane to release an internal spring operated mechanism. Manual pull stations that require two hand motions such as; lift up and pull down or push in and pull down for example have since replaced the break glass and single action models in many modern installations. In the past, fire alarm pull stations controlled the entire system. These coded pull stations were much bigger than modern pulls and had a code wheel in them. This was a gear mechanism that was wound up when the station was pulled (and, unlike modern pull stations, the handle did not stay down). The gears would turn a small wheel with a specific number of teeth, which determined the coding. The teeth would push up on a contact, which would open and close a circuit, pulsing the code to the bells or horns. This code was used by building security to determine where the alarm was originating from. Example: a pull station in the fourth floor elevator lobby of an office building has a code of 5-3-1. When the station is pulled, the security officers in the building look up 5-3-1 in a master list of codes. After finding the location of the pull, they check to see if there is a real fire. If there is, they evacuate the building and call the fire department. Many modern fire alarm pull stations are single action and only require the user to pull down the handle. Other fire alarm pull stations are dual-action, and as such require the user to perform a second task before pulling down, such as lifting up or pushing in a panel on the station or shattering a glass panel with an attached hammer. Perhaps the most recognizable pull station is the T-bar style pull. The style is so named because the handle is shaped like the letter "T". This style is manufactured by many companies. A Simplex single action "T-bar" pull station. Resetting a fire alarm pull station after it has been operated normally requires building personnel or emergency responders to open the station using a key, which often is either a hex key or a more traditional key. Opening the station normally causes the handle to go back to its original position, allowing the alarm to be reset from the fire alarm control panel after the station has been closed. In areas where false calls are a problem, pull stations may be covered with a clear plastic cover that sounds a loud tamper alarm when removed, creating focus on the fire alarm. If this is not a sufficient deterrent, the pull handle may be loaded with ink, powder, or gel dye which can be used to help identify who pulled the alarm. Ask your Fire Alarm and Home Alarm Systems Question HERE! Every body use fire alrm. Everybody sinsharly take firealarms. fire is a bad effect in our life.